LET NEWSMAKER SIMPLIFY YOUR WORKFLOW. DISCOVER THE FUTURE OF LIVE NEWS AUTOMATION. MAKING NEWS WILL NEVER BE THE SAME AGAIN. IT'S EASIER THAN IT EVER HAS BEEN. 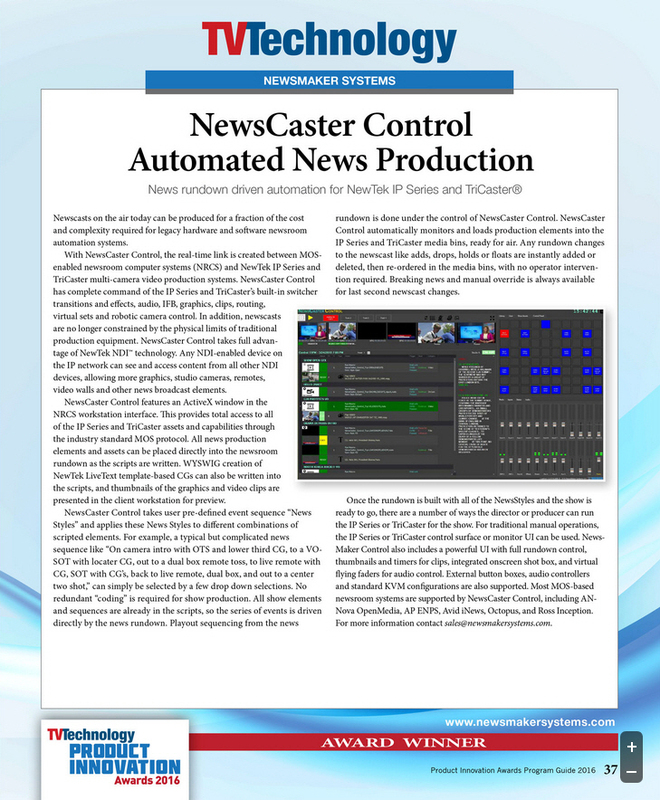 The NewsCaster™ is the #1 show automation solution for the NewTek TriCaster® Family & IP Series. Watch below to learn why. NewsMaker has over 40 years of experience in the field of news automation. Our goal is simple: we want to make your life easier and make your production better. Our NewsCaster™ automation suite is affordable, reliable, and easy to use. We offer the only automation suite designed specifically for the NewTek TriCaster® Family & IP Series. Similar automation products treat the TriCaster and IP Series as an afterthought; we treat it as the main course. By partnering directly with NewTek, we create a richer user experience that utilizes the entirety of flexible and fast features offered by the NewTek TriCaster® Family & IP Series. The NewsCaster Suite™ offers full control of the NewTek TriCaster® Family and IP Series. Our specialization in TriCaster Family and IP Series automation has resulted in a product that utilizes the full creative potential of your hardware. Anything that the TriCaster Family or IP Series is capable of doing can be automated to your exact specifications; just add it to your rundown and press play. All-in-one show planning, automation and production. See why broadcasters choose NewsCaster CONNECT. Our automation suite is custom tailored to meet your needs! Schedule a demo to see how we can fit into your workflow. NewsMaker is dedicated to supporting our clients. Learn more about how we can support your show.